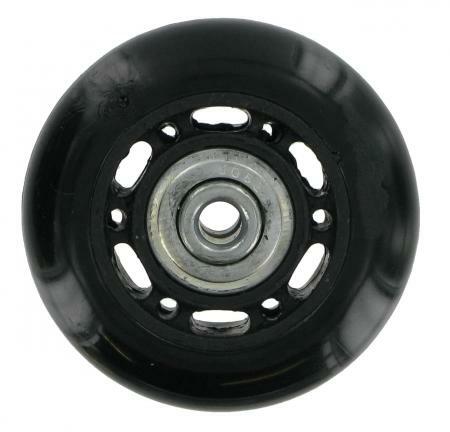 This is a replacement wheel for those people who are unable to obtain a complete wheel unit for their suitcase and are considering changing the wheel alone. Quite often the wheel has worn a flat spot where a stone has wedged itself into the unit making the wheel drag rather than turn as it should. Step 1 Unzip the case lining and take a look at the reverse side of the wheel unit. You should be able to see screws, rivets or both. Step 2 Un-screw the screws and drill off the rivets (being careful not to heat the rivet too much with the drill, as this will melt the housing). Step 3 After completing step 2 the housing should come out of the case easily. You must now examine the axis pin, as it needs to come out. If you are lucky, the pin will be held in with either a grub screw or surclip these come out easily. Other axis pins need drilling out carefully, once again do this without heating up the pin or melting the housing. Step 4 Replace the old wheel with the new one and replace the axis pin. If you had to drill out the axis pin, you may need to buy a new one (our product code ohl2185). Step 5 Put the unit back into the case. If you had to drill out any rivets, you can simply use a nut and bolt of the correct diameter and size.